ASX investors know the benefits of investing in the healthcare sector, having seen some major payoffs from the biotech and medtech spaces, specifically. Topping the list are household names such as $90 billion capped biotech leader CSL Ltd (ASX:CSL), diagnostics company Sonic Healthcare (ASX:SHL), and medical device companies Resmed (ASX:RMD) and Cochlear (ASX:COH), to name just a few. While those companies are well beyond their days of being up and coming listed juniors, there remains a lesser known slice of the healthcare sector: the fast moving health informatics, or healthcare IT sector from which the next household names could emerge. Like biotech and medtech, health informatics, the management and use of data to improve healthcare analytics and clinical decision support systems, will ride similar macro thematics: rising healthcare spend, growing — and aging – populations, and technological and medical innovations. In fact, clinical data management is now the focus of strong innovation. As this sector moves to digital solutions in order to improve productivity and address clinical risk and avoidable errors, it will replace legacy IT systems and manual communication tools that are just not doing a decent enough job. There’s winds of change blowing through the City of Churches. While it is best known for the Fringe Festival and being the gateway to wine country, it may also be home to a revolution in healthcare informatics. And that is all down to one company. Adelaide-based Alcidion Group (ASX: ALC) and its leading edge, adaptable informatics technology. Alcidion was onto something as its tech is being adopted by major hospital groups worldwide. The company, which arrived on the ASX in 2016, via a reverse listing into a mining company, has all the makings of being a breakthrough stock in this sector. While trading on the ASX with a market cap of just $44 million, ALC already has some serious healthcare clients on its books, including the UK’s National Health Service (NHS), Queensland Health, NSW Health, Victorian Department of Health and Human Services, ACT Health, and eleven District Health Boards in New Zealand. Yet it is still early days, with demand only now increasing as health providers look to improve patient outcomes and reduce inefficiencies in healthcare delivery. Thus it is safe to say, effective solutions to avoid preventable errors, while at the same time improving efficiencies, are still hard to come by. That’s where ALC steps in, and why I believe a large-scale rollout of its solutions could propel the company and send its stock well above its current four cent share price. Adding to the list, ALC has today announced that it has won a major contract with Dartford and Gravesham NHS Trust in the UK, under which Alcidion will deploy the first Miya Precision, Patientrack and Smartpage installation outside of Australia. The five year contract with Dartford and Gravesham is valued at £1.16 million (A$2.1 million). Quirke said, “This is a major win for Alcidion. Although the company has a strong presence in the UK with Patientrack, this is the first integrated installation of the complete product platform – Miya Precision, Patientrack and Smartpage – outside of Australia. Alcidion will deploy the Miya Precision platform integrated with Smartpage and Patientrack in all wards across the entire Trust, to enable safer and more efficient patient care, reduce the burden of paper and deliver state-of-the-art information and technology to frontline clinical staff. The product suite will provide electronic patient observations, electronic paper charts, clinical assessments, clinical noting, patient flow, bed management and electronic discharge summaries for GPs. The clinical team will have online access to patient information 24 hours a day, where and when required to provide the optimum level of patient care through mobile computing. The company last year made some considerable strides as it delivered much needed data solutions to hospitals and healthcare providers. It made a number of acquisitions, while continuing to develop its health data management technology. To make this leap to “transform healthcare”, Alcidion Group completed the acquisition of IT solutions and services provider MKM Health along with Patientrack and healthcare software company Oncall Systems (Smartpage) last year and commenced integration of these newly acquired entities with its existing leading core technology, Miya. Adding these businesses delivered a broader portfolio of products and services, a larger and more diversified customer base and an enhanced financial profile. Here’s a snapshot of the business’ transformation over the past 12 months. The two acquisitions delivered a diversified product platform, enhanced IT and sales capability, significantly improving the company’s financial position. 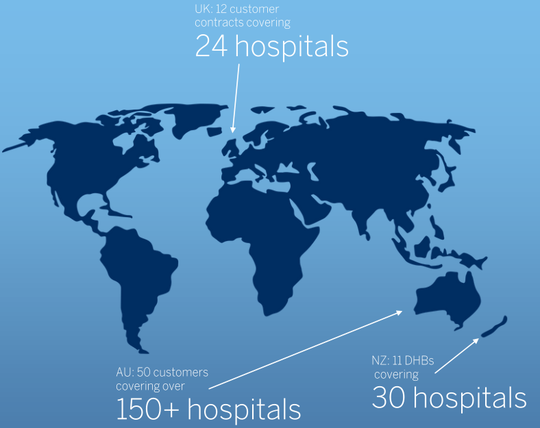 Each company brings a complementary set of products and skills that create a unique offering in the global healthcare market. A hospital is actually a whole lot of little industries. Orthopaedics and obstetrics, for example, are completely different. Each has really interesting, yet quite different insights into the patient’s data. ALC has built a platform that allows that flexibility across a hospital system and related industries. Its solutions support interoperability, allow communication and task management, and deliver clinical decision support right at the point of care in order to improve patient outcomes. ALC’s leading edge platform is Miya Precision. 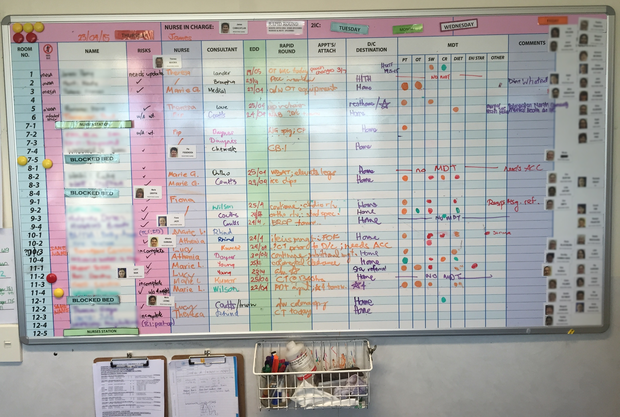 Existing systems involve planning and tracking of the patient journey via whiteboards. The information is entered manually and only available in one place, leaving room for errors and is not gathered from or pushed back to other electronic systems. The result is a non-patient centric workflow that leads to inefficient patient journeys and unnecessary increases in patient length of stay. Miya Precision is broken down into Miya Patient Flow, Miya ED and Miya Revenue and Reimbursement. Miya Patient Flow brings together various sources of hospital information and highlights the most relevant/risky items. It enables the review and capture of data at the point of care on mobile devices or via large wall mounted dashboard displays real-time. This improves clinical outcomes, clinician productivity and patient safety, as well as hospital efficiency and the utilisation of resources. Miya Patient Flow assists with bed management and patient allocation, which involves managing and maximising the utilisation of beds within a hospital and assigning patients to the most appropriate location. Bed managers can spend hours walking around the hospital checking each ward for information about planned patient movement using clipboards, spreadsheets and out of date lists to gather a picture of current and likely future bed status. Additionally, it provides an “at a glance” view of bed utilisation/free capacity. This enables efficient, real time planning and coordination of patient movement and hospital bed stock. It also improves bed manager productivity, improves hospital efficiency and utilisation of resources, and enables hospitals to measure and beat their performance targets. Miya ED allows an Emergency Department team to highlight key risks, activate best practice guidance for common problems and detect and manage high risk lab results that arrive after the patient has been discharged. In such a dynamic and high-paced area as the ED, easy and quick access to clinical information is paramount. 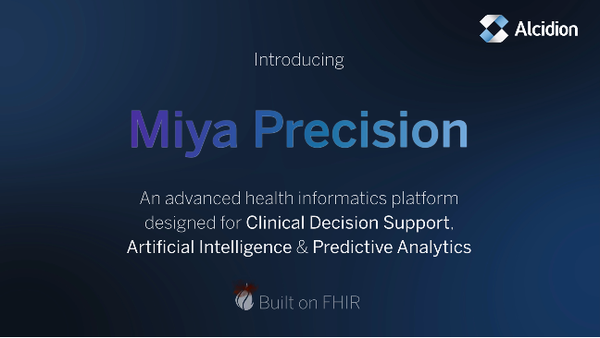 Miya Revenue and Reimbursement reduces revenue leakage and improves safety with using ALC’s enterprise health informatics AI and machine learning to maximise existing investments and bring clinical data to life. Medical teams can detect and monitor risk and safety in real-time while reducing revenue leakage and the risk of clawback. 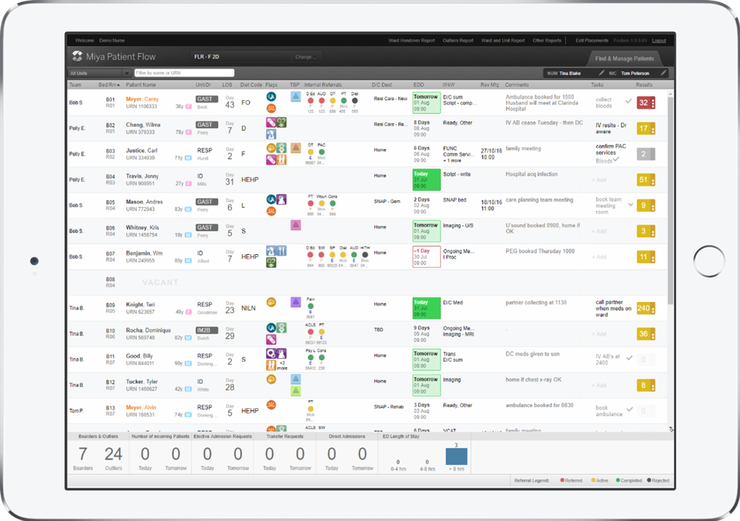 Patientrack is highly complementary to the Miya product suite. Hospital observation taking has long been a manual and paper based process that relies on nurse’s memory, is difficult to measure and results are only accessible on the ward. Troublingly, Early Warning Score calculations, which determine the degree of illness of a patient and prompts critical care intervention, are often incorrect, while pre-printed paper charts make it difficult to implement personalised, patient-level adjustments, and raising an alert to the appropriate level is subject to personal judgement, and isn’t always done in real time. Patientrack solves these issues with measurable on-time observation recording at the point of care, and clear, concise identification of tasks, legible charts accessible wherever the user may be, and a host of other benefits that ultimately improve patient outcomes — that is, shorter length of stay, and fewer unplanned admissions into ICU. Clinical trials have shown an impressive 80% reduction in cardiac arrests along with a more than 20% reduction in hospital stay. As it stands, and has been the case for decades, pagers are still the most common device used for clinical communication between doctors, nurses, and other care team members. Yet pagers are antiquated devices that provide no useful clinical information: urgent issues are missed, patient safety is put at risk and decisions are delayed. Along with pagers, public address systems are still used, causing patient unrest and messages being delivered to the incorrect staff or not heard at all. These issues are exacerbated after hours due to lower staff numbers in the hospital and fewer specialty doctors being on shift. 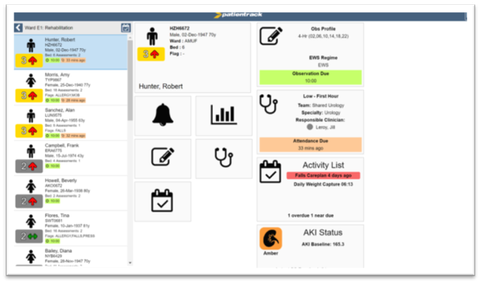 Alcidion’s Smartpage has been developed to address these issues, as a fully featured mobile clinical collaboration and task management solution. Smartpage is a highly available SaaS delivered solution that can be tightly integrated with Miya Patient Flow. It provides instantaneous two way messaging with read receipts and guaranteed delivery between all members of the care team. That means symptoms, results, observations, notes and photos can all be sent in real time to doctors. Nurses can then receive instant feedback from doctors, preventing wasted time following up lost pages. Ultimately, the system means that patients receive the best possible care at all times of the day and night. All of Alcidion’s systems are separate, and can be purchased and utilised independently as has already occurred in the UK. They can also be deployed and run together with full interoperability. As discussed, ALC has a foot in the door in the UK, a market which is more than twice the size of Australia and New Zealand combined, yet could be the source of plenty more growth. Adding to the attractiveness of this particular market, the UK’s National Health Service (NHS) recently let on that it is transitioning to artificial intelligence (AI) and paperless systems. The NHS is allocating £4 billion (A$7.5 billion) to transition to a paperless environment, the benefits of which will transfer to software groups that can deliver this technology, along with their shareholders. 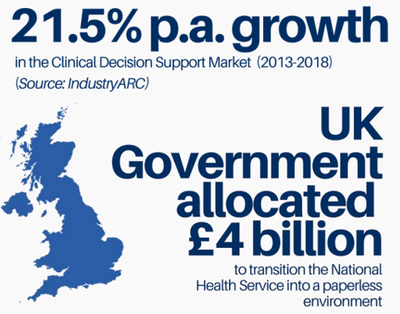 As stated in the graphic above, the clinical decision Support Market grew by an average of 21.5% per year from 2013 to 2018. A white paper by Alan Mak MP, Powerful Patients, Paperless Systems, was written about how technology, and especially paperless systems, can renew the UK’s NHS and mentioned ALC’s Patientrack technology. The whitepaper specifically referenced St Helens and Knowsley Teaching Hospitals NHS Trust which have gone live with Patientrack, replacing a previously paper-based system, recording vital signs, bedside using a tablet. It noted that this automation of the previous paper system increased efficiency, but most importantly, improved patient safety. It is this traction that is partly responsible for ALC’s growth and improving financial performance. The UK is just one market, but the global market is also growing. In the US, $40 billion was spent in digitising patient data. “The market opportunity is significant,” Quirke says. “From our perspective there's 150,000 beds in the UK and Ireland, which we've probably got about 20 or 30,000 at the moment. There's 62,000 in Australia, I think we've got about 20,000 beds covered. But it will only be with one of our products. So the capacity to then cross-sell is important. “The market is also significant in the geographies Alcidion operate in, but there's also emerging markets in Canada and that we will look to beyond our initial consolidation. “ALC has gone from being a loss making proposition overall with around $4 million in revenues annually, to already having $14 million contracted this year, so far. About 50% to 60% is recurring. Alcidion is striding towards profitability, all the while making strategically important investments that will help drive future growth. 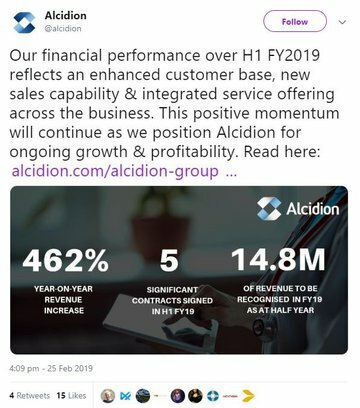 Alcidion completed the acquisition of the MKM Health and the Patientrack businesses last year then commenced their integration with the existing business. The acquisitions delivered the group a broader portfolio of products and services, a larger and more diversified customer base and helped boost its financial outlook. 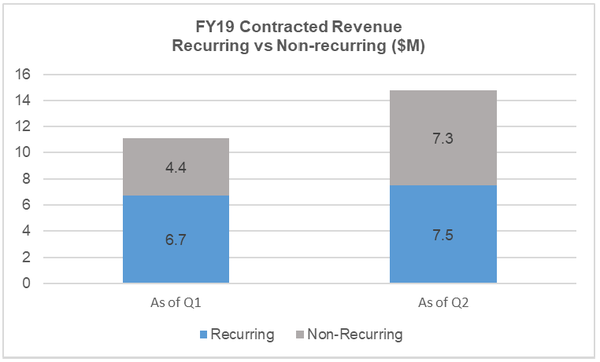 Consider that for the first half of FY2019, total revenue grew to $7.3 million, up from $1.3 million just a year earlier — a direct result of the newly acquired businesses contribution, as well as new contract wins and renewals. The contract wins and renewals after the merger, in the six months to December 31, were worth $23.4 million and included contracts with several large public health organisations such as Queensland Health, Alfred Health, NT Department of Health and ACT Health. This brought total contracted revenue to $42.2 million, of which $14.8 million should be recognised in 2019. Here you can see the contracted revenue that’s to be recognised between 2019 and 2024, broken down by product revenue and service revenue. Trading at just 5.3 cents per share, and with a market cap of just $44 million, ALC is extremely well placed for significant growth. Revenues are on the rise with the benefits of the enlarged group, with smoother operating cash flow, and a healthy sales pipeline and the opportunity to leverage cross selling opportunities. 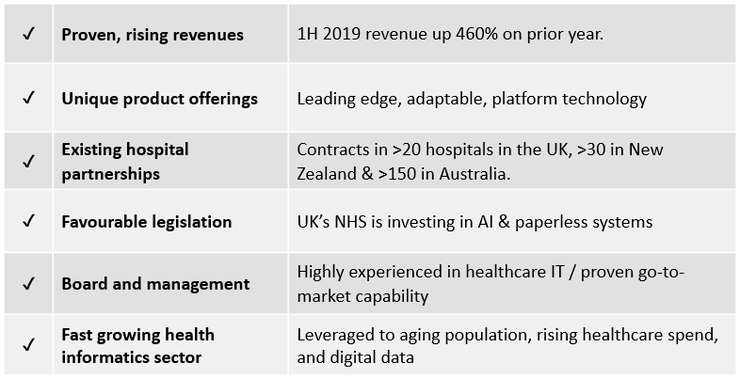 With multiple major hospital groups already signed on, its newly assembled management team and recent product acquisitions, plus being perfectly positioned as the healthcare industry transitions to AI and automation, ALC has as many catalysts behind it as any ASX-listed small cap.